Cliff Outdoors Big Cliff fly box has been called the perfect "dry/dropper" box. The Cliff Outdoors Big Cliff fly box has durable foam strips securely hold the large patterns and small flies are help in place (even in big wind) on the magnetic base. Cliff Outdoors Big Cliff Fly Box is finally here. While our Days Worth continues to be the "go to" box for thousands of anglers, some people (including Big Cliff) kept asking when we were going to build a bigger box. On our favorite rivers we (and lots of other anglers) have found that a two fly system is the most effective way to catch fish. Most of the time the second fly is small (size 18-26). We needed a tough box that can effectively manage lots of small and large patterns for those times when we aren't on our home water. The Cliff Outdoors Big Cliff fly box is the answer. The durable foam strips securely hold the large patterns and small flies are help in place (even in big wind) on the magnetic base. We were happy that Team USA used this box as their competition box at the 2001 World Championships. Check one out for yourself. 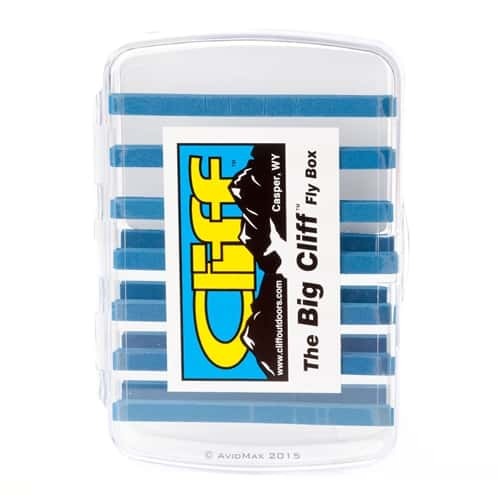 See why the Big Cliff fly box has been called the perfect "dry/dropper" box.